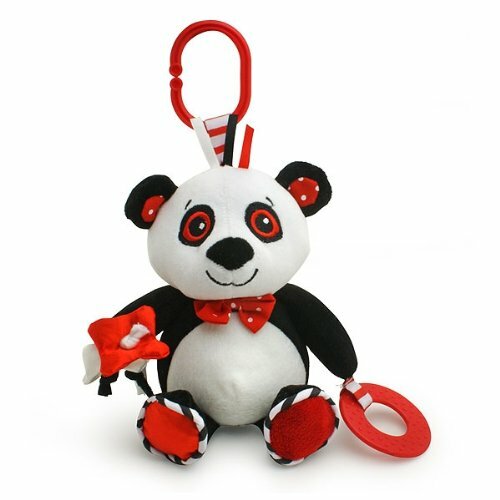 Piper the Panda - black, white and red, developmental baby travel toy - by Genius Baby Toys. Piper the Panda - On-the-go with baby travel toy. High contrast black, white and red colors hold baby's attention. The panda toy comes complete with a link, making it easy to take along with you. Piper Panda crinkles, jingles and squeaks - as well as includes baby-safe teether. Piper Panda will warm parents' hearts with its expressive face and soft features. The panda comes complete with multiple textures and sounds to keep baby entertained. Generous toy size - Dimensions: 6" x 4.0" x 8.0" birth and up. Generous Size - Toy Dimensions: 6" x 4.0" x 8.0"
crib, playpen.... anywhere baby goes.